How do you honor a life? Let’s plunge into the Deeper Waters and find out. I woke up Saturday like it was much any other day. At one point, I knew we needed some groceries so I tell Allie I’m off to the store to pick some up. There I am walking through the frozen section when I hear my phone go off indicating a text message. Well, let’s see what Allie wants me to pick up that she just remembered. It was my mother-in-law, Debbie Licona. The timestamp shows that that message came in around 2:25. I wandered through the story trying to remember what I needed to buy and trying to keep a brave face about me. Inside, I was heartbroken. Yeah. We knew that this was coming. We knew it could have been any day now. Still, there’s something of a shock when the news finally comes. I was also worried about my wife at that point. She does not handle bad news well and she was home alone. Before too long, the news had broken from other sources all over Facebook. My father-in-law had tweeted it out and that’s when Debbie told me she had already told Allie. I went through the shopping of that day watching other people go about their business as if it was an ordinary day. I turned on the radio in the car and heard talk radio that was about sports, which I already don’t care for, but which I cared for even less this time. How can you talk about sports when this has happened? How can people go about their day normally? Don’t you know a great man has died? I remember being rung up at Sprout’s and the cashier giving me my receipt and saying “Have a good day.” My thought in my head was “Whatever that means.” Today is not a good day. Today we lost Nabeel. I had got to know Nabeel through Mike. I remember being with him at a restaurant I think after or during the apologetics conference talking about life in general. I had messaged him some on Facebook and I loved his book Seeking Allah, Finding Jesus. Nabeel had been a guest on my show once talking about Islam. Those interested can find that here. Nabeel bravely battled against stomach cancer. There was always a hope that he would be healed, but it didn’t happen. It’s times like this I wondered what God was thinking. Why Nabeel of all people? He didn’t deserve this did he? I also sadly saw some Muslims speaking about where they think Nabeel is now. I know there are some who are celebrating. I saw them post when the news came happy that Nabeel was getting what they thought he deserved. It’s tempting to reply with anger at them, but you know what? Nabeel wouldn’t want that. Nabeel was also young. Younger than I am right now, and that makes me wonder what I’m doing with my life. It was also the kind of event that made me want to come home and hold my wife close to me. I don’t know how many days we have together. I want to make the most of them. I miss Nabeel now. I didn’t get to know him well enough as I should, but I always enjoyed my time with him. Sadly, I probably took it for granted. He was young and healthy. He’ll be with us awhile. I was wrong. I hope I’m not taking anyone else in my life for granted. 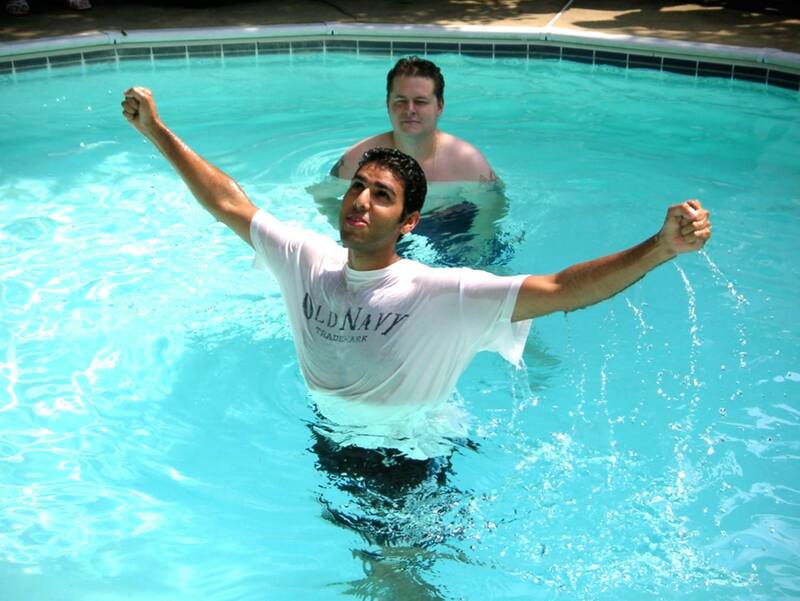 There is a picture going around Facebook of Nabeel after his baptism. He has his arms raised in his air in victory. In the past, it brought joy, but today it brings me sadness. I know it should bring me joy, but it doesn’t because I want to see the happy and healthy Nabeel again, and I don’t. It’s obvious my sadness is not for Nabeel. He is far better off. It is for myself. It is for his family and all others left behind. Nabeel. Thank you for being my friend in this time you had with us. I look forward to everlasting friendship with you one day.